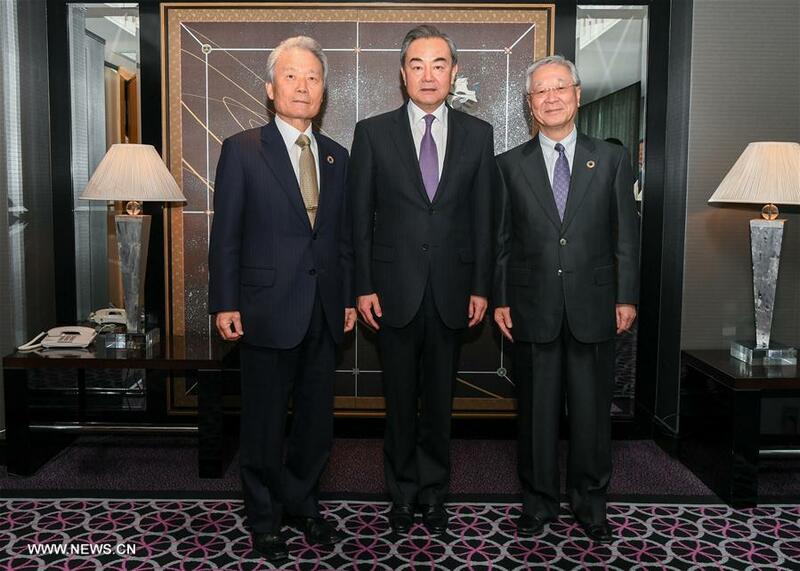 TOKYO, April 17 (Xinhua) -- Chinese State Councilor and Foreign Minister Wang Yi met with figures from Japanese economic circles here Tuesday, including Sadayuki Sakakibara, current chairman of Keidanran or Japan Business Federation, and Hiroaki Nakanishi, who has been elected Keidanran's next leader. Wang said that Keidanran has been dedicated to promoting friendship between China and Japan through economic cooperation despite bumps and difficulties in bilateral relationship. Currently, the economic situation in both China and Japan and the international economic environment are undergoing significant changes, and under the circumstances, China has manifested its determination to further deepen reform and expand opening-up on the occasion of the 40th anniversary of China's reform and opening-up, he said. Chinese President Xi Jinping has announced recently the new measures for expanding China's reform and opening-up at the opening ceremony of the 2018 Boao Forum for Asia annual conference, and Chinese economy has been turning from development with high speed to development with high quality, all of which will provide important opportunities for China's cooperation with countries all over the world including Japan, he added. Wang said that under the new circumstances China is willing to promote the upgrading of its economic relationship with Japan; to welcome Japan to join the Belt and Road Initiative, which will open up new space for bilateral economic cooperation; to work with Japan to promote global free trade, safeguard World Trade Organization (WTO) rules, and develop an open world economy. It is hoped that Keidanran will continue its efforts and bring its advantages to full play to make contribution to improving China-Japan economic cooperation from a new starting point and to promoting world economic development, he said. Members of Keidanran said that they were inspired by the momentum of improvement in bilateral ties between China and Japan. Keidanran has long been dedicated to promoting friendship between China and Japan and supporting China's reform and development. It is willing to actively participate in the Belt and Road construction and continue to make efforts to promote friendly cooperation between the two countries and develop closer economic ties, they said.